When looking at taps for your bathroom, there are numerous considerations to take into account. Size, style, and water pressure are just some of the elements to consider, but most importantly, it has to be a practical choice that best fits your household. Keuco's mixer taps are the perfect choice for your basin, as they are versatile in their aesthetic, complementing a multitude of designs, whilst also performing exceptionally - making for a reliable selection whether you're refurbishing your entire bathroom, or just replacing your tap. Keuco has a proud history of crafting high-quality bathroom products. Since being established in 1953 it has consistently expanded its range, growing from a unique specialist and leading provider of high-end bathroom accessories, to an extensive supplier of all kinds of bathroom furnishings. This includes fittings, accessories, mirror cabinets, washbasins and more. Keuco delivers its customers with the highest possible quality products, shaped through an innovative design ethic and the best materials available. An elite level of craftsmanship guarantees that Keuco products will be used and enjoyed for many years. A genuine passion for the bathroom runs deep with the family-run Keuco company. This passion flows throughout their products, serving to invigorate and awaken the senses, to refresh and cleanse the body and mind. Products represent an authentic style of luxurious elegance, blending function with aesthetics and ergonomics. Key elements of the company's success involve a dedication to contemporary innovative products, as well as an obvious focus on design, and a constant commitment to modern manufacturing. Keuco products set themselves apart with gleaming surfaces, lengthy lifespans and effortless function. 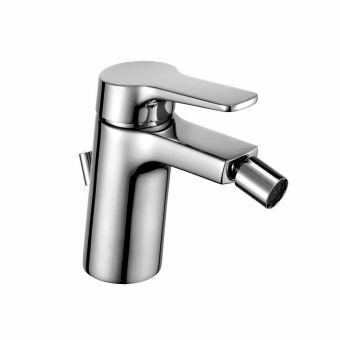 At UK Bathrooms, we're proud to stock Keuco taps and mixers, and are certain that there will be the ideal choice for your bathroom from their extensive range. Exhibiting the streamlined appearance which is a trademark of the outstanding Moll Collection, the Moll Single Lever Basin Mixer Tap boasts the perfect marriage of technology and design. Crafted for use with single-tap-hole basins, ceramic disc cartridge features enable an elegantly smooth glide of water. Water flow is capped at 6 litres per minute, giving an economical, minimal waste approach. Simple control of temperature and flow with the single lever is complemented with a useful waste management system through a pop-up lever found on the back of the unit. Alternatively, with the standard tap, your own unit can be used. 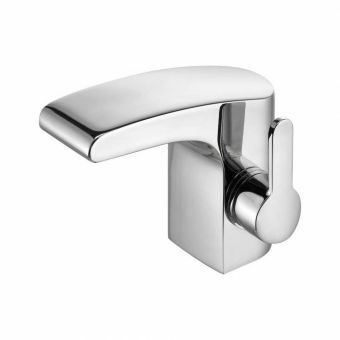 Finished in stylish chrome, this is a perfect addition to any contemporary bathroom. Striking an exceptional balance between sleek elegance and robust form, the Elegance Basin Mixer would exquisitely slot into a high fashion washroom. While its chrome cast chic complements modern bright interiors, an overall accessible design and feel makes it effortless to use. A single lever offers a silky level of command over water flow and temperature, and integrated ceramic cartridges guarantee a steady continuous flow. Versatile enough to suit almost any contemporary décor, this mixer can be fitted with minimum fuss into numerous single-hole basins. Quick and easy elimination of waste water is enabled through a pop-up lever waste system, adding to a pleasingly intuitive user experience. 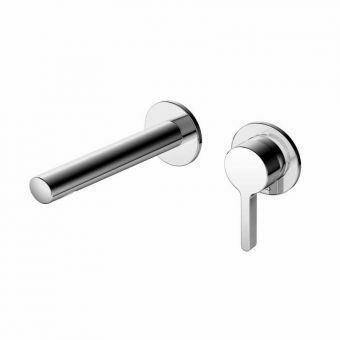 The Keuco Moll range promises to give a futuristic shine to any bathroom. Shaped out of solid brass and luxuriously coated in an excellent quality chrome finish, the Moll Single Lever Small Basin Mixer adds a vividly modern look to the washing space. An arresting reflex angle immediately draws the eye. Crafted for use with a miniature basin, this mixer’s tighter dimensions slot ideally into smaller en-suite spaces. Integrated within the body is a ceramic disc and aerator, guaranteeing consistent running and a velvety smooth action. Meanwhile, the single lever delivers command of balance between hot and cold water. A flawless complement to the bidet, this chrome-plated mixer tap is shaped in a modern style, giving you total simple command of water flow and temperature. Sustaining the robust but sleek values of the Moll range, the Moll Single Lever Bidet Mixer also incorporates ceramic disc technology to help accomplish the exact balance on every use. A pop-up waste lever is included as standard, completing a spotless and straightforward waste management system. The water flow rate is reduced to 6 litres per minute, ensuring a gentle, low wastage flow. 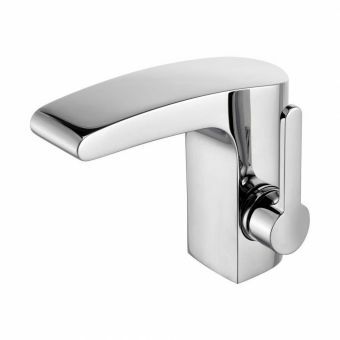 The Elegance Single Lever Basin Mixer 90 was appropriately named. Living up to the Elegance of its title, a fashionable cocktail of function and visual appeal is exquisitely served through a dependably solid design. As suggested in its projection of 139mm, the shorter form is ideal for compact basins with shorter deck areas. Comprehensive command of water flow and the temperature is supplied through the single lever, and ceramic discs enable a silky smooth flow rate. Crafted for installation in basins with a single tap-hole, the dazzling chrome and streamlined contours mean it is a precise fit for any modern bathroom, cloakroom or washroom. The modest decadence of a concealed wall-mounted basin mixer supports you in immediately promoting a bathroom from the standard, to the extraordinary. As a highly evolved Keuco design, this results in a basin sink of refreshingly minimal and uncluttered charm. It also presents an effective way of saving space and giving extra storage space. It is constructed in Germany from elite materials, using up to the minute production techniques. This creates its veneer of subtle chic. 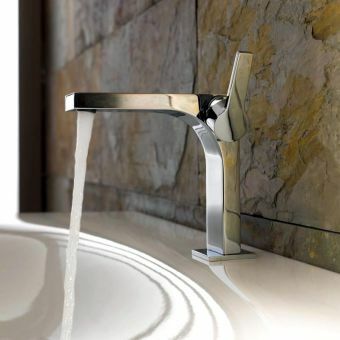 Separate lengths enable the tap to be placed in the right position for the desired water flow and Keuco also suggests using its own concealed part. This gives a permanent and discreet fixing to the water services. A ceramic cartridge is responsible for delivering water at the desired temperature. Never a company to shy from stretching boundaries of bathroom design, Keuco again demonstrates its innovative flair through the 400 Side Lever Basin Mixer. 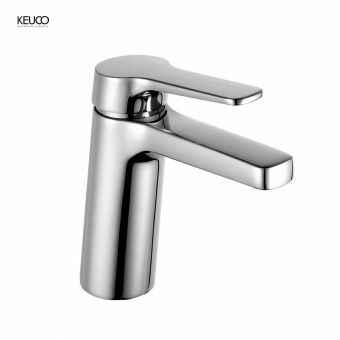 Sturdily faultless engineering gives a reassuring feel to the swivelling spout, another Keuco innovation that also compliments their commitment to reducing water consumption. 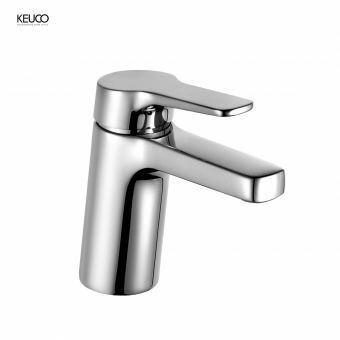 The dazzling chrome finish subtly embedded with the Keuco brand name ensures an outstanding tap that literally shines with quality. Standing 180mm tall but hidden from sight are two flexible 435mm long pressure hoses. These ensure your water connections are straightforward using the industry standard G 3/8 inch screw fitting. Single hole installations fit almost all basins and the 7.6 litres per minute flow rate is controlled by the multi-angle side lever. This employs ceramic discs to make sure your new tap stays dripless. Easily adjusted from side to side using gentle click locks at 45 degrees and with an integrated aerator, the spout’s velvety flow of water is assured. Dynamic looks never go out of fashion. The Keuco Edition 400 Single Lever Basin Mixer stands proudly with a statuesque appearance, generous in size and features. Invigorating and refreshing sensations can be repeated upon each use of this creation. Making innovative use of ceramic disc control guarantees there will be no more leaking or dripping taps. Meanwhile, a single hole integration means flexible water hoses can simply slide into place, fusing to your hot and cold without any fuss. A complementing chrome pop-up waste can be included to reduce plumbing time even more. This is controlled through a concealed lever at the back of the tap. Different sizes can be ordered to suit the amount of reach needed for individual basins. However, the family-sized mixer has a strong reach of 153mm. This size usually covers most installations with ease but for smaller basins a smaller tap with 115mm reach may be more appropriate. Keuco's dynamic range of mixer taps should enable you to make a selection that is appropriate and complementary to your bathroom design, old or new. 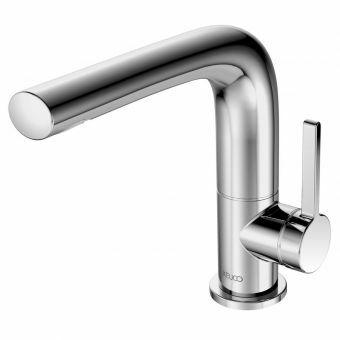 Mixer taps make an ideal selection due to their flexibility, without the fuss of two separate temperature taps. This also makes the Keuco range an equally useful choice for families as well as professional couples, as Keuco epitomises style and substance. Even in a more traditional bathroom, the relative subtlety of Keuco's flawless designs allow a seamless installation, whatever the look you're going for. In addition to the longevity and function available throughout the Keuco line of products is a commitment to innovation and design. Design is the heartbeat that drives Keuco efforts to craft classical modern aesthetics, which can effortlessly retain a contemporary aura, even following decades of use. 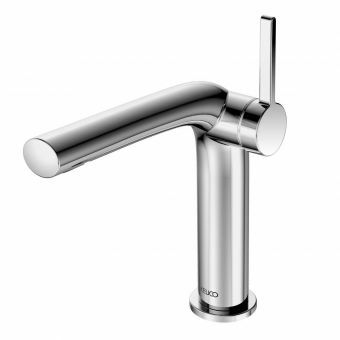 Thanks to their range of taps, you can now have the luxury of Keuco in your bathroom, through their inspired selection of products.